Bright material extends out from the crater Canuleia on Vesta. 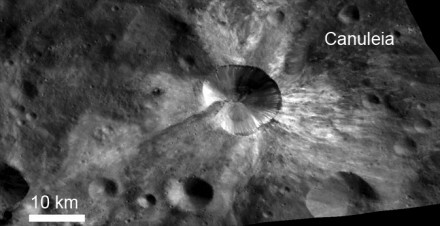 NASA's Dawn spacecraft has revealed unexpected details on the surface of the giant asteroid Vesta. New images and data highlight the diversity of Vesta's surface and reveal unusual geologic features, some of which were never previously seen on asteroids. Vesta is one of the brightest objects in the solar system and the only asteroid in the so-called main belt between Mars and Jupiter visible to the naked eye from Earth. Dawn found that some areas on Vesta can be nearly twice as bright as others, revealing clues about the asteroid's history. Bright areas appear everywhere on Vesta but are most predominant in and around craters. The areas vary from several hundred feet to around 10 miles across. Rocks crashing into the surface of Vesta seem to have exposed and spread this bright material. This impact process may have mixed the bright material with darker surface material. Higher-speed asteroids also could have hit the asteroid's surface and melted the volcanic basaltic crust, darkening existing surface material. That melted conglomeration appears in the walls and floors of impact craters, on hills and ridges, and underneath brighter, more recent material called ejecta, which is material thrown out from a space rock impact.